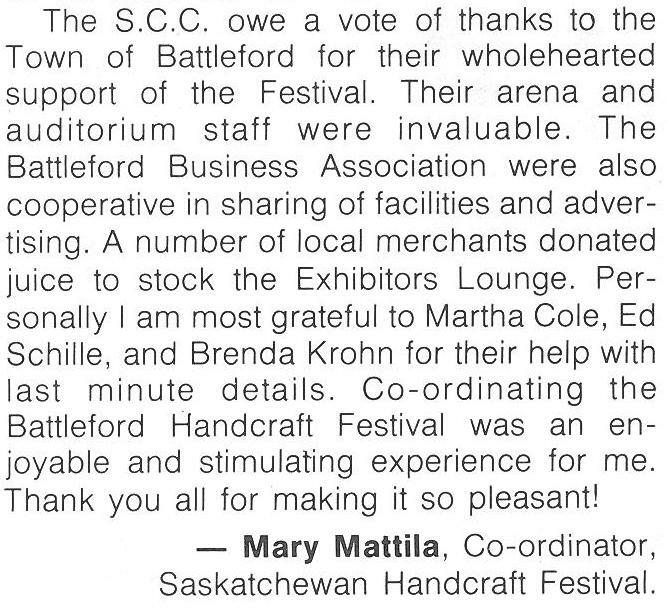 Leading up to this momentous occasion, on Talking Craft, we'll take a look back at the history of the Festival, beginning with this report from the 10th Annual Saskatchewan Handcraft Festival. The SHF has undergone many changes over the years, but the one thing that has remained constant, is the support from the Town of Battleford. The Town of Battleford continues to provide the Alex Dillabough Centre to the SCC for no charge, including staff time, which is an investment worth thousands of dollars. This contributes greatly to the continued success of the Handcraft Festival.